This week's blog post is all about the Grand Hotel in Minneapolis. Oooh lala! I sat down, er, I walked around the hotel, with Kathryn Billig, Sales Coordinator. This hotel is amazing! Not only are the rooms terribly romantic, antiquated but modern at the same time, but the amenities offered for wedding parties are a bit jaw dropping! Read below about what Kathryn has to saw about this grand space! My favorite thing about helping wedding groups is getting to know the couple, their guests and families. Many of them call with questions on the hotel, or to have me make their reservations. It’s fun to get to know them and I feel like I’m part of the family! Many of them ask for me when they arrive so I actually get to MEET them which is such a treat! I even have a mother of the bride that I still exchange recipes with regularly as we both enjoy baking. The Grand is a Kimpton Hotel, the chain empowers its employees and hires people that add to one another's creativity. I LOVE THE PEOPLE HERE. We have such a eclectic array of characters that work at The Grand Hotel and they all bring something special to the table. I wouldn’t trade any of them for anything. I count myself lucky to be a part of such a special group of people. The Grand Hotel was originally the Minneapolis Athletic Club, and just turned 100 years old in 2015. Kimpton loves older buildings that have a story to tell. I am a history nerd, so I love learning new little tidbits about the building, the old staff, and what Minneapolis was like when the Minneapolis Athletic Club or “MAC” was younger. My favorite discovery so far: MAC had a mission to be the premier club within the city. They did many public events, community outreach, and, of course, believed that having a good time was important. Kimpton is also all of those things. I love that we can keep that going. I have such a hard time picking my favorite place in the hotel. I love that we have our gym location, but that is such an obvious choice simply because it is so unique. I have yet to discover another luxury boutique hotel with a 60,000 square foot gym with a basketball court! 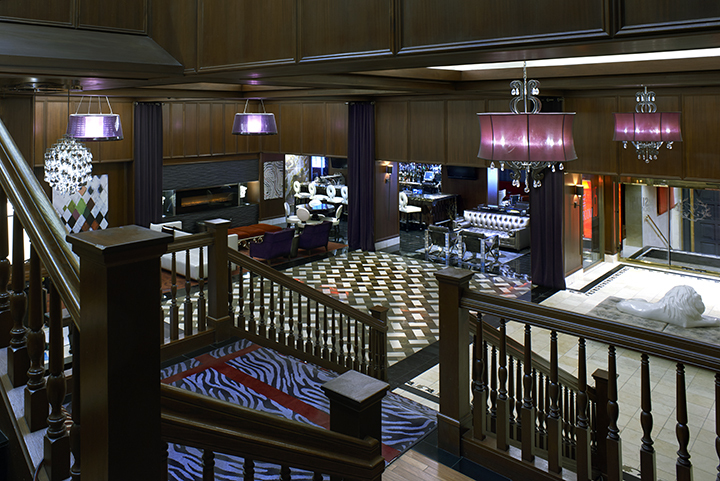 However, I would say that my favorite amenity is the SIX15 Room Lounge which is our lobby restaurant and bar. Our Executive Chef, Kris Koch, has created a fun menu with locally sources items. There are so many fun things to choose from, but my favorites are the Walleye Tater-tots, and the Grand Club. You’ll have to make sure to come in and try them!! I love everything about the color red. It’s bold, passionate, and photographs so well. I’m a redhead, so I may have a biased opinion on the color red, but it is also the color of love and passion. Kimpton is also a fan of bold colors in design, so I enjoy seeing a bold color in weddings. My best advice for newly engaged couples is to try not to stress over the little things. Details are important, but the wedding should be fun! So many people will throw their opinions at you, but you know what’s right for you and your fiancé. Finding the best vendors and venues will make things move more smoothly as well. Find those of us that care about you and what your special day means to you. 7. Anything else you want to tell me! Do crazy things! Challenge yourself to think outside the box! Understand that you are important and special! Do the hard things that no one wants to do! Explore Kimpton Hotels . . . . and come to The Grand Hotel and join me for some Walleye Tater-tots and a cocktail! I want to thank Kathryn so much for the tour and for her great insight - be sure to check out the hotel when thinking of a downtown venue, or room blocks! My favorite part: the salon and spa = hair and makeup onsite the day-of; the lobby - it's pristine; and the bridal suite (pretty much just calling out my name!). Let's not forget the Lifetime gym, perhaps a little morning yoga before your vows? !